The CommonKindness community is full of amazing and supportive partners and we would like to take this opportunity to feature and honor their extraordinary efforts and acts of kindness. CommonKindness is proud to present our latest Official Recipient of the Partner in Kindness Award for going above and beyond in spreading the message of kindness to their community. "I am so honored to be chosen as your partner in kindness! I was raised to believe that being a helper or looking out for others is just what you do. Unfortunately, that is not the norm so it's absolutely refreshing to find companies like Common Kindness that live by that rule. You set the bar for the rest of us! Kindness in any form, should be shared. 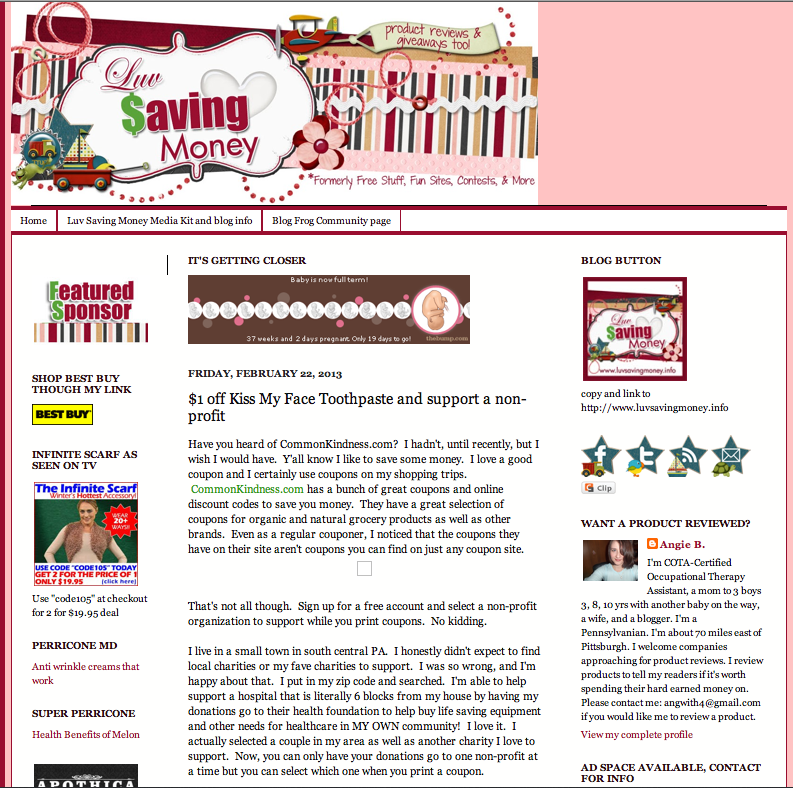 It is my hope that I can continue to share the kindness message and try to help make a difference even if it's only by helping someone save money." Let me start off by saying, I am NOT a coupon site! However, there will be times that I share a few here and there. That's because I fully believe in what Common Kindness is doing. If you haven't heard of them before, then you need to check them out. You can get a number of fantastic coupons there but what makes them different is every time you use one of their coupons, they provide funds to a non-profit of your choice! Isn't that cool? I believe there needs to be a little more kindness in this world. It doesn't matter who is on the receiving end; it could be a neighbor, a stranger, or even an animal. As long as we are sharing kindness, we are changing the world. You may not even know that your smile of acknowledgment to a stranger may be the difference between his/her deciding to take his life that night. It's amazing what a little kindness can do! "I am honored to be Novembers Partner In Kindness. I hope my words will be a reminder of what this season is truly about. My main focus this year is reaching out to those in need and helping people save money through couponing all over the U.S. No one should go hungry!" "Keep in mind that holidays are not always easy for everyone. One simple kindness can change the world, maybe not your world, maybe not THE world, but someone’s world CAN be changed by your random act of kindness. You can always volunteer time at a shelter, Salvation Army, or Infant Crisis Center. You can also make a donation to any number of organizations or become an Angel for a local Christmas Tree. But, we all know how busy the holidays can be and how tight money becomes in these last 2 months leading up to them. So, instead, ask your waitress to have a seat while she is taking your order. Chat with your cashier about how their day has been and be kind even if they are getting frazzled by the crowds. Give up your valuable coupon to someone in front of you in line if you notice they are struggling (or even if you don’t!). An act of simple kindness doesn’t have to put a dent in your wallet. Help a new mother get her groceries in her car or offer to take the basket to the corral for her. Even a simple compliment can brighten someones day. There are so many ways to help out, be creative and remember that sometimes a smile instead of a frown can make all the difference!" "Well, I had a little flutter in my stomach of joy when I heard I was chosen as the current Partner in Kindness for CommonKindness. I really try each day to find a way to keep kindness going in my little world, so being recognized for this today just means I'm doing the right thing and should continue my mission of doing good." 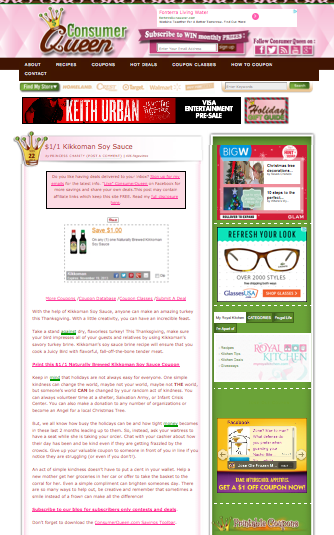 "We love to print the HOT coupons when they are available! Did you know there is a site where you can print/redeem coupons from all of your favorite companies AND help Non Profits at the same time? 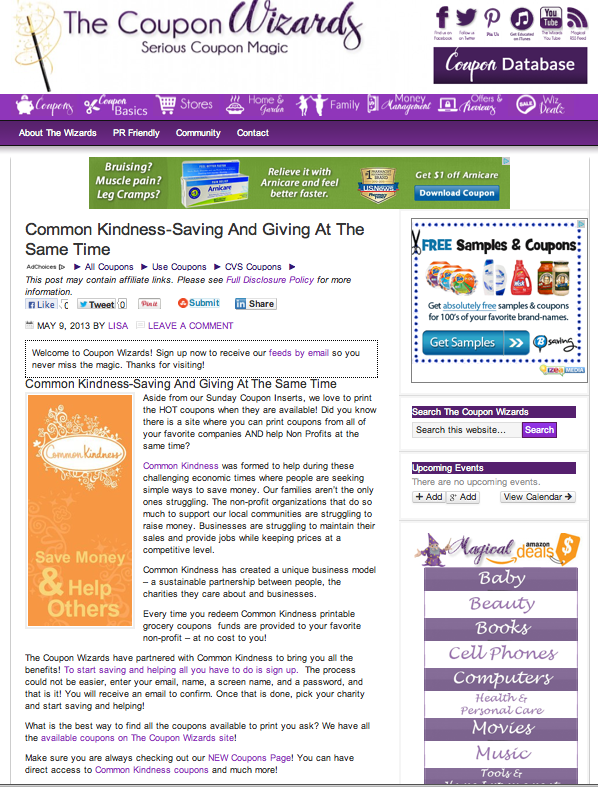 Common Kindness was formed to help during these challenging economic times where people are seeking simple ways to save money. Our families aren't the only ones struggling. The non-profit organizations that do so much to support our local communities are struggling to raise money. Businesses are struggling to maintain their sales and provide jobs while keeping prices at a competitive level. Common Kindness has created a unique business model - a sustainable partnership between people, the charities they care about and businesses"
"CommonKindness.com is a great place to find not so common coupons to print. 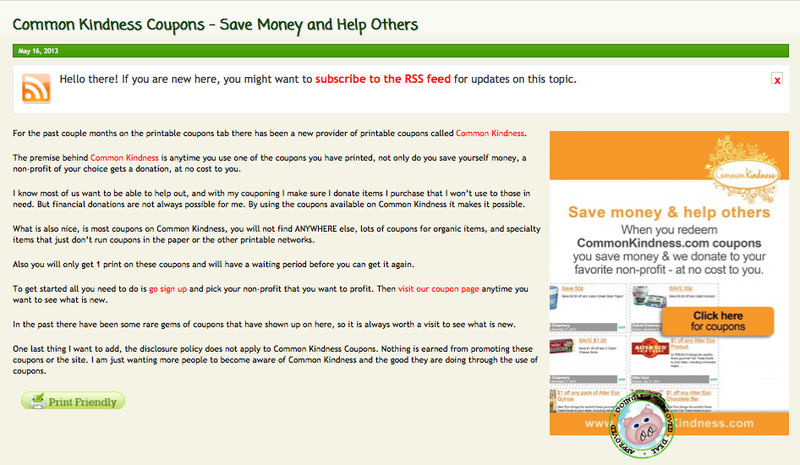 What I like best about CommonKindness is the fact that when I print / redeem coupons to help me save money on products that my family uses, I am also helping a non-profit organization. CommonKindness.com donates 20% of funds received to a non-profit of my choice. Living in a small town as I do, I didn't think I would find a non-profit in my area to assist. Boy was I wrong!!! There were over 7 pages of non profits listed. I've decided to support Rocking Horse Ranch Therapeutic Riding Program. It feels good to know that even in these difficult financial times I can help provide someone with a better quality of life just by printing a coupon." "Have you heard of CommonKindness.com? I hadn't, until recently, but I wish I would have. Y'all know I like to save some money. 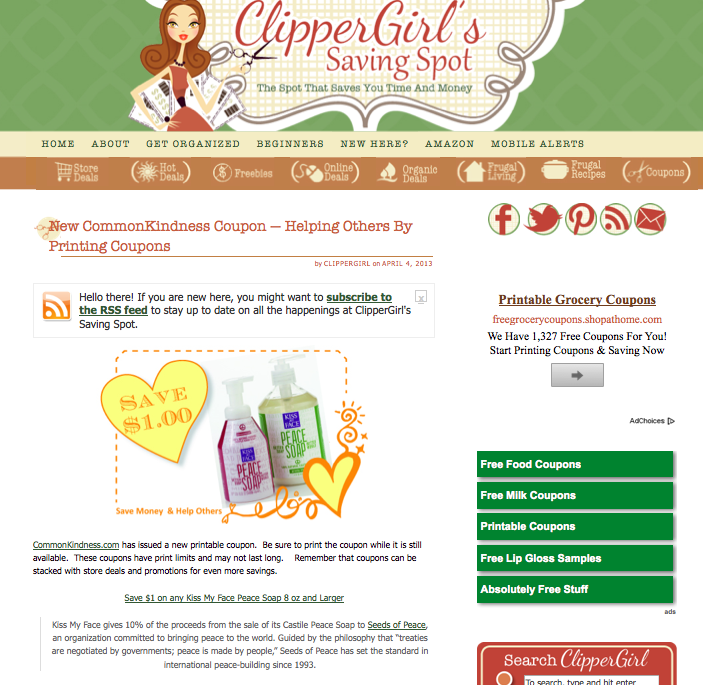 CommonKindness.com has a bunch of great coupons and online discount codes to save you money. 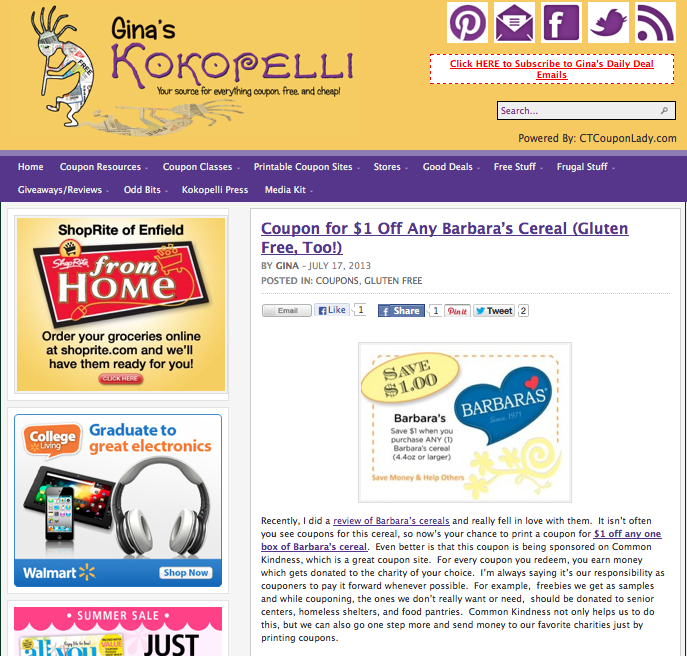 They have a great selection of coupons for organic and natural grocery products as well as other brands. Even as a regular coupon user, I noticed that the coupons they have on their site aren't coupons you can find on just any coupon site. That's not all though...Sign up for a free account and select a non-profit organization to support while you print / redeem their coupons. No kidding. I live in a small town in south central PA. I honestly didn't expect to find local charities or my favorite charities to support. I was so wrong! I put in my zip code, searched and found that I'm able to help support a hospital that is literally 6 blocks from my house by having my donations go to their health foundation to help buy life saving equipment and other needs for healthcare in MY OWN community! I love it! I actually selected a couple in my area as well as another charity I love to support. Now, you can only have your donations go to one non-profit at a time but you can select which one when you print a coupon." 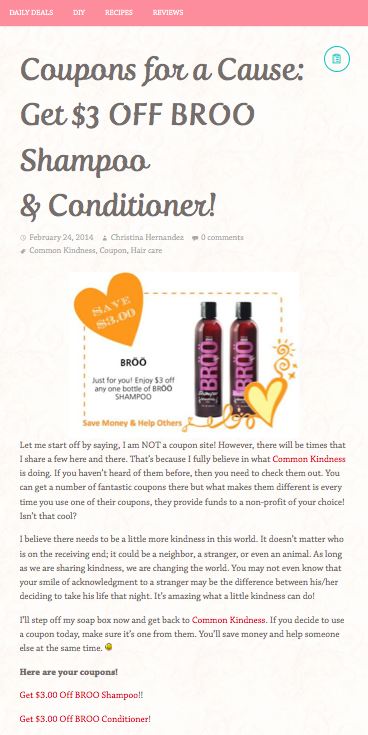 "CommonKindness Valentine's Day Coupons! Can you feel the love? Everyone know it's important to be kind to yourself but it's just as important to be kind to others. 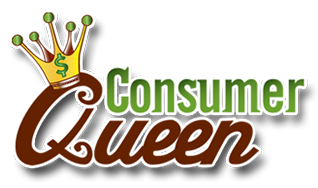 We know that all you, our Discount Queens family, care about being kind to others too! Showing a little kindness can be as simple as holding the door open for someone OR shopping using coupons from CommonKindness. 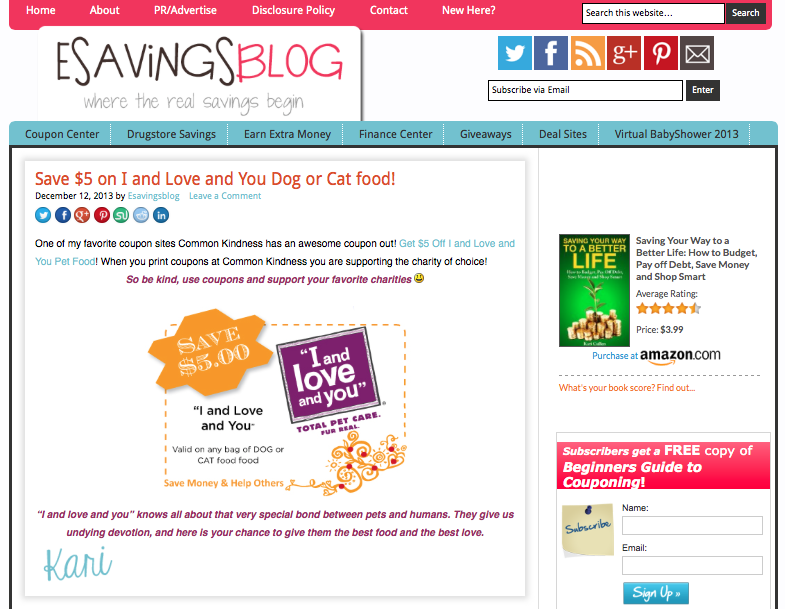 Every time you use a CommonKindness coupon a donation goes directly to the non-profit YOU choose! Pretty easy, huh?" Request your iFrame code today!